Apple's Tweet Upstages Tim Cook's iPhone 7 Reveal - Joe.My.God. 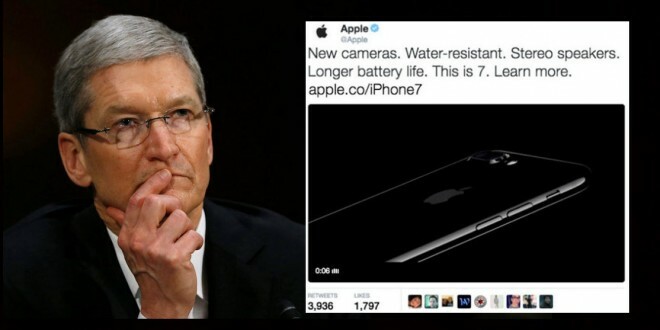 Apple’s big reveal for iPhone 7 was upstaged thanks to its own Twitter account … where images of the new phone were leaked even before CEO Tim Cook could unveil it. Cook was right in the middle of the iPhone debut presentation from Apple HQ — but hadn’t actually shown the device … when a few tweets went out from the company’s account. OOPS doesn’t begin cover it. Sorry, Tim … but now everyone knows: Water resistant, new camera, stereo speakers, longer battery life. Really no need to continue your speech. Heads would’ve rolled under Jobs. Apple only turned on their Twitter account a few days ago and tweet above was quickly deleted. In a similar move, this morning Amazon jumped the gun with their iPhone 7 accessories page.